On our way back from the Georgia Organics conference in mid-February, Ken and I stopped to visit Julia Asherman’s impressively diverse farm in Jeffersonville, Georgia. (Then we had to catch up on office work before finding the time to write this post!) 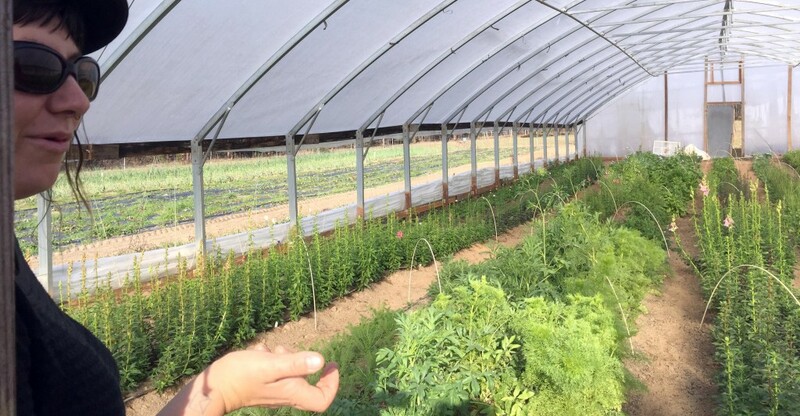 At this time of year, much of the farm is in cover crops, and most of the action is in her high tunnels. “Rag & Frass Farm” was named in deliberate contrast with farm names that sound overly romantic or “like gated communities.” But one of Julia’s main sources of income about as romantic as it comes: selling flowers for weddings. She and her seasonal apprentices also sell common types of vegetables, and various crops that are hard to find fresh or local. They sell through her local farmers’ market, and through a farmers’ cooperative, and some years through a CSA. She has a visions of a farm stand and a pick-your-own section of the farm with blueberries and tea. Julia brought out a bottle of dark brown syrup from sugar cane she’d planted the year before, and a tan bottle of vinegar made from the syrup, and we each tasted both. Last year she’d planted the canes in a 200-foot row and took the harvest to a neighbor who had an old cane press, and gotten 54 bottles of syrup and a few bottles of vinegar. I would have liked to buy a bottle of syrup, but she only had one left; the rest had sold at her farmers’ market for $15 each. Between turmeric, ginger, (both shown at right), sugar cane, and strawberry “daughters,” Julia has been doing a lot of vegetative plant propagation. 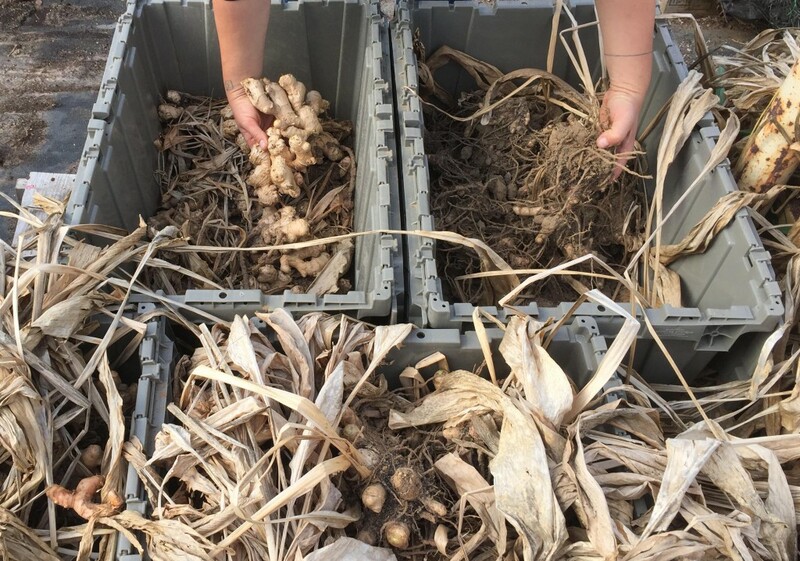 She’s also been experimenting with seed-saving for years, and she and Ira had talked some about seed growing at previous farm conferences. Our visit marked her first transfer of seed to a seed company. We hadn’t been expecting it, and rarely do we buy seed from farmers we haven’t already contracted with. 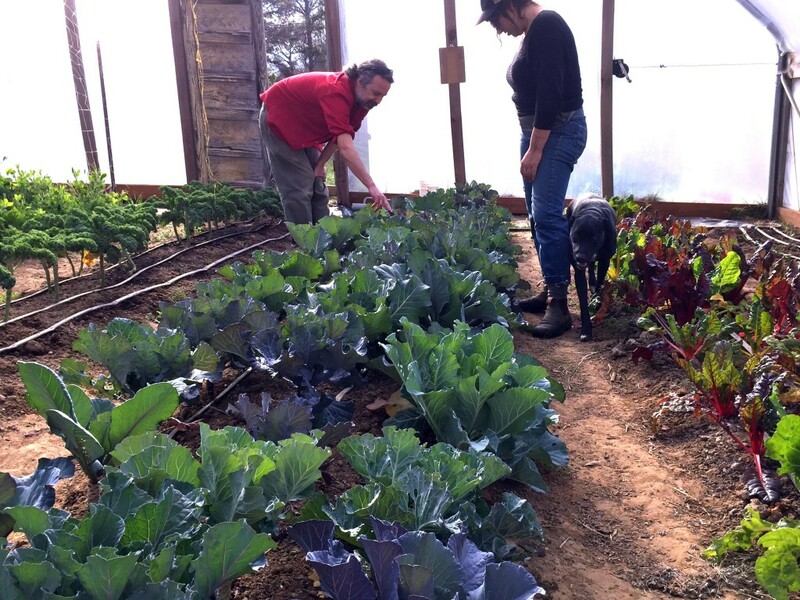 But we saw that she had a blue landrace collard growing in her high tunnel, confirmed that it was Alabama Blue, and mentioned that having a collard seed crop in a greenhouse would increase the germination rate of the harvested seeds by keeping rain off the seeds as they dry on the plants. With seed crops in the collard family in the moist Southeast, the main challenge is to get the seed to mature without getting too wet. Julia had previously harvested 2 pounds of Alabama Blue collard seed that she didn’t have a plan for. We brought the jar back to our farm for germination testing. We looked together at the Southern Exposure list of seed crops for 2017, and chose several that Julia will grow for us, including Red Foliated White cotton (with permission from her local extension agent), Statice, Old Fashioned Mix Nicotiana, Heavenly Blue morning glory, and a yet-to-be-determined cosmos. Julia has been growing a Jungle Striped Peanut for the past couple of years. We ate a few, found them tasty, and brought home some seeds to try out in our garden. She sells bundles of freshly dug peanut plants with the pods still on them, and this fall she’ll probably also sell some to us as a seed crop. 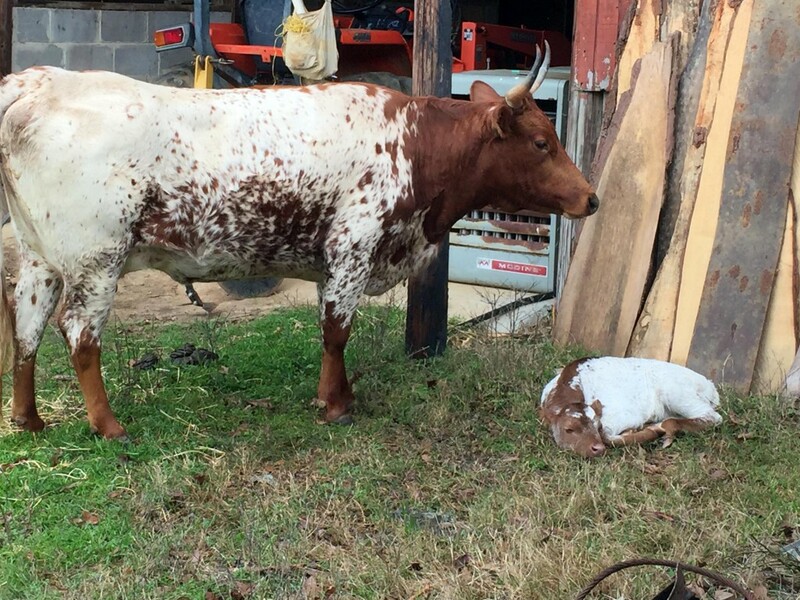 The day before we visited, Julia’s heritage breed Pineywoods Longhorn cow had given birth to a calf. 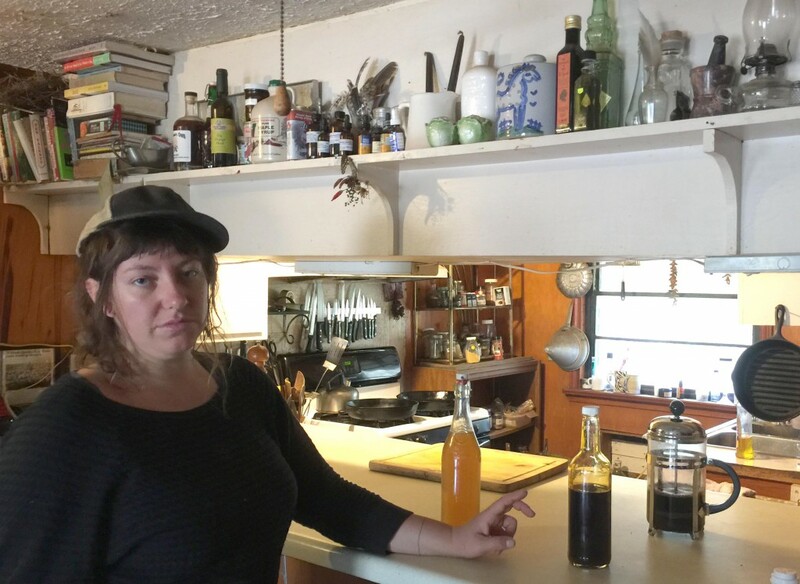 Julia is about to close, in the, next few weeks, on her 54-acre parcel, including a former motel and the 3 acres she’s and her apprentices have been cultivating for the past 4 years. You can read more about her farm on her website, http://www.ragandfrassfarm.com.